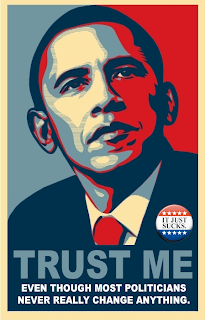 Obama sold trust. Where McCain got any inroads during the campaign, it was in sowing doubt about Obama. And where Obama jumped ahead, it was when people got scary economic news and needed to trust someone - and they couldn't trust the sitting president. Could Hillary be trusted? Well, not as much as Obama. Could McCain be trusted? Not as much. Obama used social media to get his brand out. And it worked. When he wants to run again, he'll have had four years of scrutiny - also called baggage. That economic meltdown will either still be there, or we'll simply be recovering from it. Those other two points won't change much. Was it a landslide due to social media effect? No - wasn't a landslide. Only in the Electoral College. Popular vote still close (53/47%) - and mostly heavy population areas. Analysts mostly talk about that independent center which moved left, as the politicians moved center. The country is still evenly divided between left, right, and center. Just the way we like it. But how we campaign now is changed forever. Just like marketing is. If you can't be trusted (like that Chicago governor) you can't get elected. People still vote the way they always have - someone most representing their values. And now we can share our values many new ways. While this may be flying a kite in a lightning storm, there's my two bits. Selling ideas to someone who will buy them.